dedication, and commitment of these driven real estate professionals make their sales production possible. They all strive to be the Best of the Best! Whenever you are buying or selling Phoenix real estate, it is important you have confidence in the Phoenix real estate professional you employ. As a Certified Residential Specialist, I meet the highest standards of the National Association of Realtors for ethics, proven performance and real estate knowledge. 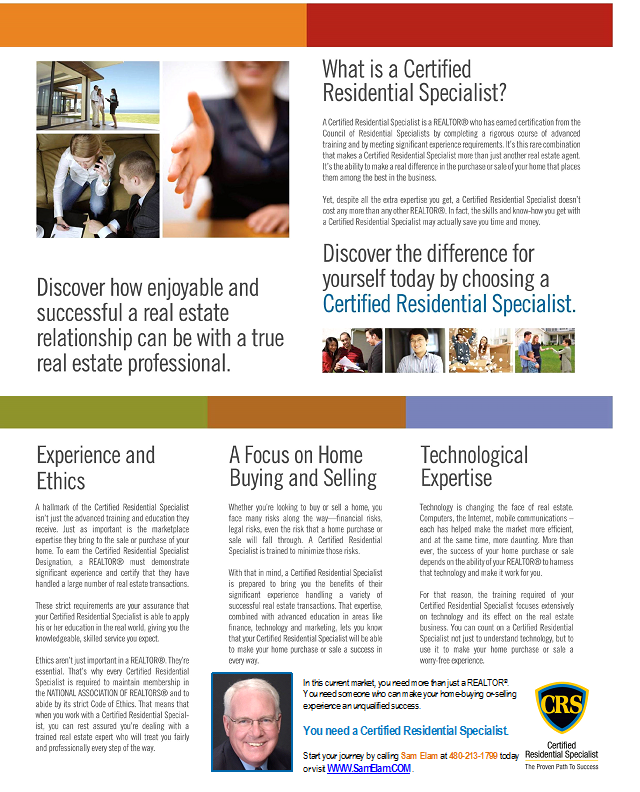 Only a select 3% of all real estate agents have met these standards to earn the CRS® designation, yet our combined sales equal 25% of all the real estate SOLD in the United States! In addition, I am a Graduate of the Realtor Institute (GRI®) and an Internet Qualified REALTOR®. As a full time, real estate professional since 1990, my extensive real estate knowledge and experience in both Arizona and before that California enables me to pinpoint the market value of your home, my proven results of strong negotiating skills ensure "you won't leave money on the table" at closing and my personalized transaction management services keep you continually updated on where we are in the process of finding a buyer and then getting the escrow closed and your home SOLD on time. Why Use a REALTOR®? Why Use an ABR®? Why Use an e-PRO®?